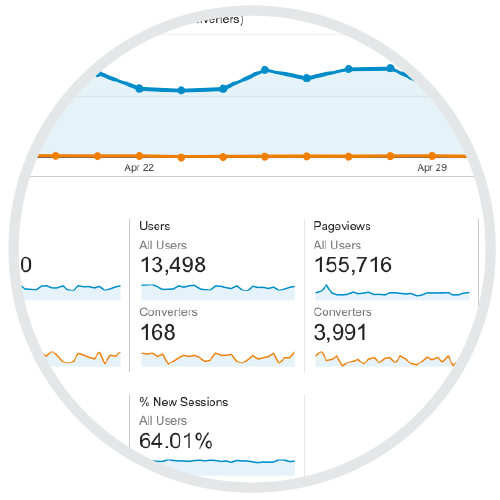 Getting started right with Google Analytics. Harness the power of Google Analytics! In this highly informative 6-hour Google Analytics course, you’ll learn the correct way to set up Analytics, create reports, analyze website data, and improve your overall web performance based on visitor data. Whether you are new to Google Analytics or need a refresher on GA reports and tools, Google Analytics 101 is for you. Understanding the Power of Analytics: Get an overall introduction to Web Analytics and Google Analytics. Account Set-Up & Management: Learn how to properly set up accounts, new profiles, install tracking codes and more. Dig Deeper into your Executive Account Structure: Learn best practices for account setting, user management & account structure. Adjust your account to easily gather the most relevant data. E-Commerce Tracking: Learn how Google Analytics works and best practices for tracking, reporting and analyzing your AdWords, AdSense and e-commerce data. Adjust and improve your ROI: determine the strengths and weaknesses of ad copy, keywords, landing pages, and more. Ted Kozlowski: Silicon Valley veteran and current President of DemandQuest, Ted Kozlowski is a seasoned technology, sales, and marketing executive. He’s been a featured speaker and teacher across the US representing companies such as Network Solutions, The Institute for Entrepreneurship at the University of North Carolina, Homestore.com, Computer Associates and many more. He has shared his expertise on social media strategy, Google AdWords Advertising, Google Analytics, and InBound Marketing with local chambers and at international conferences. He is also the current Mayor of Stillwater, MN. The DemandQuest Marketing Institute: the Twin Cities’ only Google Certified Premier Partner offering complete digital marketing training. Unlike other companies who send trainers to Minneapolis for a week, we were founded and are based in Northeast Minneapolis. We have a stellar reputation and have been voted Best Digital Marketing Training for three years in a row.